Oak Leaf Studio resident artist Leif Trygg is now offering home portraits. 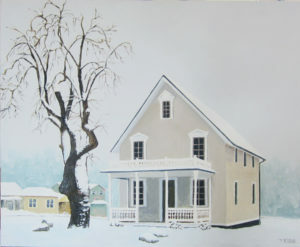 An original painting of your house is a treasured historical family keepsake or can be a thoughtful gift. Created based on a photograph Trygg takes, or you provide, these pictures become wonderful generational gifts chronicling the transitions of your own family. Choose among acrylic, watercolor or pastel mediums. Included with the home portrait are a dozen note cards with matching envelopes.